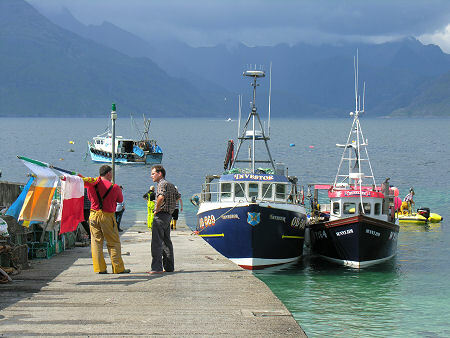 Elgol is a beautiful place, and it has a particular attraction for anyone with an interest in Scottish mountains. While Glen Brittle and Sligachan both lie closer to the main Cuillin ridge, they lie outside the horseshoe shape it describes. 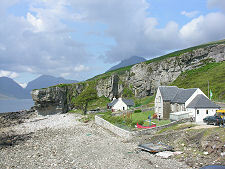 It is only from the south, from Elgol, that you can look right into the heart of this savage mountainscape. 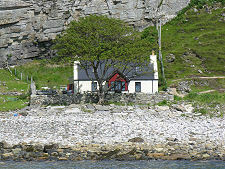 To get to Elgol you take the B8083 single track road that heads south west from Broadford. This leads you through Strath Suardal and past the ruined Cill Chriosd (Christ's Church) and its fascinating and superbly located graveyard. 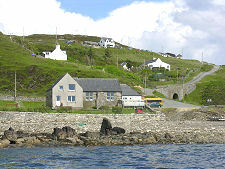 Cill Chriosd served as the parish church until 1840, when it was replaced by a new parish church in Broadford. 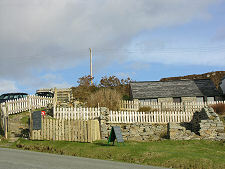 As the road approaches Loch Slapin it passes through the village of Torrin. Quarrying still takes place on the east side of the loch here. But as you begin to drive towards the north end of Loch Slapin you are guaranteed not to notice as your attention is drawn across the loch to the towering bulk of Bla Bheinn, or Blaven. This magnificent mountain is an outlier of the Black Cuillin. It is sometimes climbed from the west side of Loch Slapin: but while it is much more approachable than any of the peaks on the main Cuillin Ridge, it is still a climb only for the experienced and well prepared. 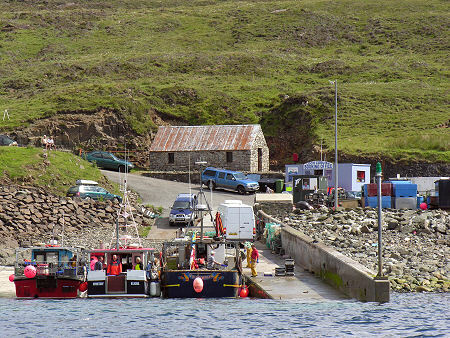 The road to Elgol rounds the end of Loch Slapin, then follows its edge south, past the many fishing vessels moored in the loch's sheltered northern reaches at Faoilean. Then the road climbs above Loch Slapin before crossing the Strathaird peninsula. As you near the top of the climb watch out for the rough land rover track heading west from the road (the parking area opposite is the most obvious sign of its location). This leads to Camasunary, the tiny settlement that provides a gateway into a large part of the Cuillin, and the start of another route up Bla Bheinn. 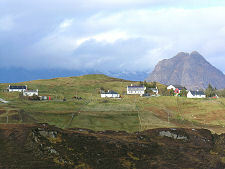 For those who like the idea of leaving the car behind, a walk of just over a mile and a half along this track, involving a climb of around 500ft, brings you to what is possibly the best viewpoint in Scotland, with a vista that sweeps round from the Isle of Rum to take in the main Cuillin Ridge and Bla Bheinn. View a 3200x600 pixel panorama taken from this spot here. 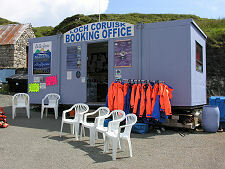 And when you are in Elgol you can do more than just view the Cuillin from a distance. From here you can gain access to the very heart of the mountains without having to walk miles across rough and boggy country, or climb over the Cuillin ridge. 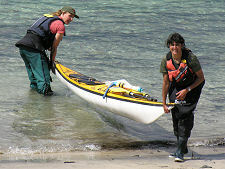 Because for centuries it has been the norm for visitors to be taken by boat right into the heart of the Cuillin. 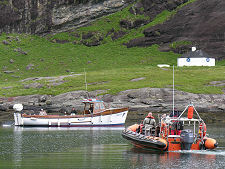 Since the early 1990s, Bella Jane Boat Trips have being doing just that: running visitors to and from the head of Loch Scavaig, from where it is a simple walk of a quarter of a mile to Loch Coruisk. 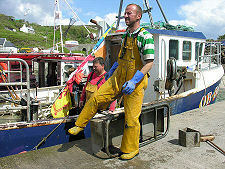 Nowadays, visitors also have the option of the similar service offered by Misty Isle Boat Trips. 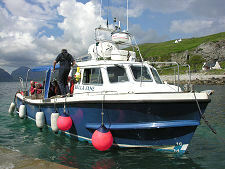 And those looking to go further afield could do worse than check out Aquaexplore's use of a powerful Rigid Inflatable Boat to allow trips to destinations as distant as Canna, Rum, Soay, and Eigg. 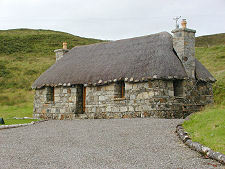 While in Elgol it is worth taking the minor road that runs for a mile and a half over Strathaird to the crofting settlement at Glasnakille: with its excellent views south east towards Tarskavaig and the Sleat Peninsula. And on your return (for it is an out-and-back trip), the Cuillin View Coffee Shop in the upper part of Elgol is also well worth exploring.